AUD is acting stronger against its American counterpart. Despite the US positive economic reports, USD is getting weak due to Trump’s speech. 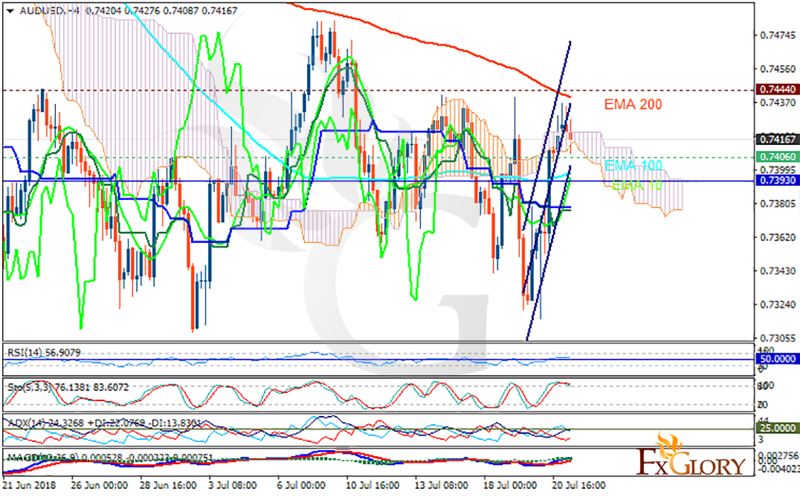 The support rests at 0.74060 with resistance at 0.74440 which both lines are above the weekly pivot point at 0.73930. The EMA of 10 is moving with bullish bias in the ascendant channel and it is below the EMA of 200 and the EMA of 100. The RSI is moving above the 50 level, the MACD line is above the signal line in the positive territory and the Stochastic is moving in high ranges. The ADX is showing buy signal. The price is in the Ichimoku Cloud and below the Chinkou Span. The Tenkan-sen and the Kijun-sen are both showing a horizontal trend. The support level breakdown will smooth the way for further decline towards 0.731; otherwise, AUDUSD will grow towards 0.747.